As you may be aware of that OAF is based on MVC architecture. 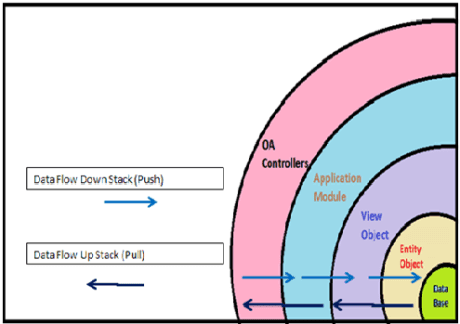 Through this article lets get into the details of MVC architecture pertaining to OAF. OAF follows J2EE Architecture and J2EE follows MVC architecture so therefore ultimately OAF follows MVC Architecture. The abbreviation of MVC is Model View Controller. 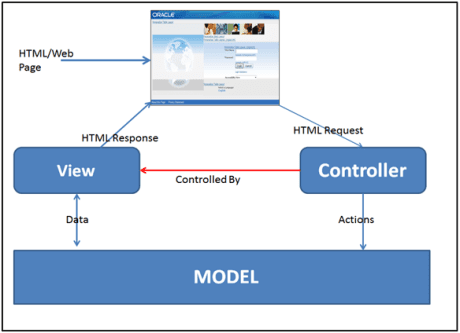 MVC is the clean design interface between Model, View, and Controller. View is nothing but the OAF Page Output. View is implemented by UIX (User Interface XML). HTTP get: While loading the Page we use HTTP Get. HTTP Post : After Loading the page if we want any changes the we use HTTP Post. We will discuss in detail about MVC architecture in the next chapters. Another structure of OAF is called Onion structure. The OA Framework can be extracted into a series of concentric layers. Each layer knows only about the layers below to them. The below figure shows the Onion Structure, in which AM interacts with the VO and VO interacts with EO and finally EO interacts with Database.